Because everyone could use a lift! This clever mix first came to us when creating our Levitation Potion Perfume, what better pairing for an enlivening social pheromone blend than the positivity of our exclusive Open Windows formula with the giddy "butterflies in your tummy" effect of DHEAS. Working in tandem to lift the mood of yourself and everyone around you, this blend is so much fun you'll feel like you can fly! 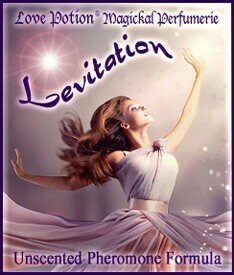 For a good time, any time, with friends, loved ones or even strangers, put a spring in your step and a song in your heart…our Levitation Pheromone Formula has cleared you for take off! Ingredients: Alpha-Androstenol, Beta-Androstenol, Epi-Androsterone, DHEAS.